2# 4 oz. Tin of Roasted & Salted Pecans - the perfect salty contradiction to our famous praline pecans! Our 2 lb. 4 oz. 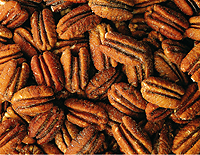 tin Roasted & Salted Pecans make a great gift or a perfect tin to sit around to snack on.